After years and years of no porcupines, this fall we kept seeing two… a smaller female and a very large male. Usually they would be waddling around in the meadow. We would see them drinking out of the brook and searching the ground for apples that had fallen from the trees. When they found an apple they would sit up and hold it in their front paws the same way squirrels and chipmunks do, turning the apple as they ate. When the female wandered too far away the male would call her back with soft almost whimpering sounds. 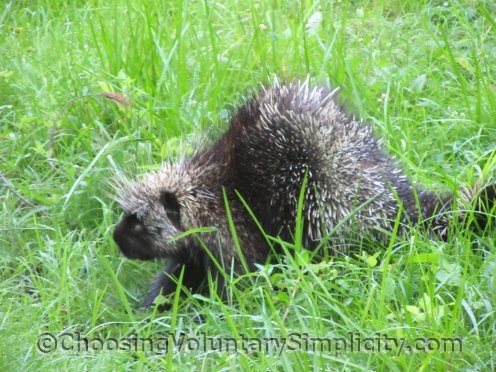 When I was growing up porcupines were one of the wild animals we used to see all the time. Usually they kept their distance but we often found individual quills on the ground, so they must have come closer to the house when no one was around. During those years we had a large and very nervous German Shepherd dog. I don’t think I will ever forget the time she had an unfortunate encounter with a porcupine and came to us with a faceful of quills. Quills had also gotten lodged in her mouth… in the sides of her throat… and over the entire surface of her tongue. From past experience we knew the only vet in the area wouldn’t be a help. And because this was such a large dog and she was so terrified and already had a reputation for being somewhat “snappy,” no one was willing to put their hands anywhere near her teeth or mouth. Except my mother… and me. That one experience gave me a healthy respect for porcupines but their quills are harmless if you don’t make contact with them. Some people think porcupines can throw their quills but that is not true… the quills have to be touched. 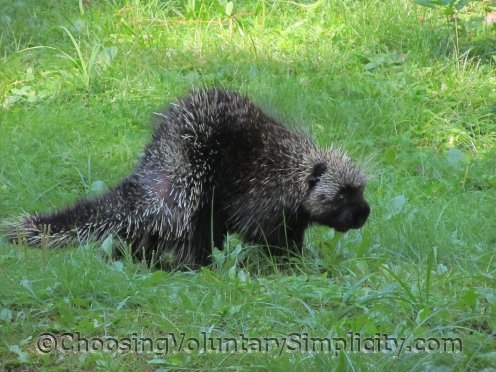 Often porcupines that have been attacked will have bare areas on their backs or tails where the quills are missing. These missing quills will eventually grow back. As always – love the story! I know exactly what you mean. We had a snappy dog that got its foot tangled in barbed wire and despite the pain he must have felt he held still until we were able to cut it away. Like you wrote – animals know when you’re willing to help them. Awwww!!! Porcupines are cute when you look at their little faces!! I never knew that. Like Sybil says, especially the pic eating the apple. That is so cute. Makes you want to hug one. OUCH! I learn so many interesting things on this blog. I have never seen a porcupine in my life, and I probably never will, but it is so interesting to read about them and see your photographs. 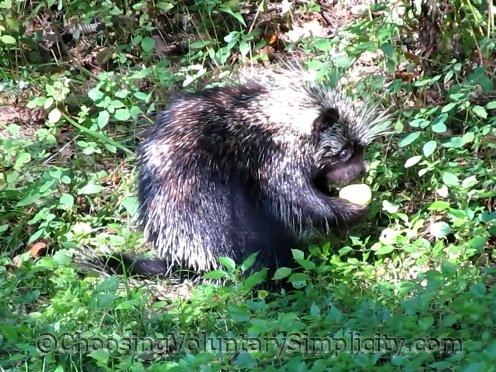 The other commenters are right, that photo where the porcupine is eating the apple is really cute. Thank you for having such a great blog.